Considered Bay City's first real settlers, brothers Joseph and Mader Trombley were drawn to the area around the Saginaw River to make their fortunes trading with Native Americans. In 1836, they began construction of the two-and-a-half story Greek Revival structure, which is thought to be the first frame house erected in Bay County and was considered the finest residence at that time. 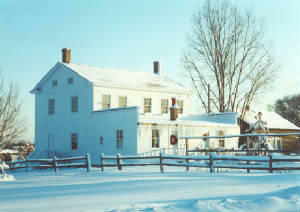 The Trombley House was relocated to its present site in Veterans Memorial Park in 1981 and is available for touring. The Olde Thyme Herb Society maintains an historic herb garden there and hosts special events throughout the year.